Can Rabbits eat Green Leaf Lettuce? 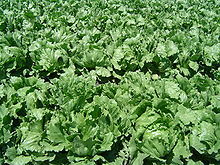 Green leaf lettuce is a hardy annual salad and is easily cultivated. It is most often used for salads however it is also seen in other kinds of food like sandwiches, soups, and wraps. It can also be grilled. So can rabbits eat green leaf lettuce, lets take a look here and find out more here. In particular we’re interested in its fat, fibre, sugar, sodium, phosphorus, and acidic content. As you can see green leaf lettuce contains quite a bit of phosphorus, calcium, but a lot acidic content. This means that unlike you see in films and other media, rabbits cant eat green leaf lettuce in abundance. In fact they can only have a nibble of it as it is too acidic in its nature for them to consume too much of it. It is a food that is best avoided to save the rabbit getting too ill.
Can Rabbits eat Red Leaf Lettuce? Can Rabbits eat Kai Lan? Can Rabbits eat Toilet Paper?